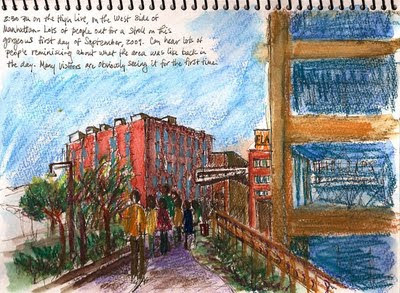 Took advantage of a half-day at work to visit the High Line, the new park that's been created from old rail lines above Manhattan's West side. It's truly a magical place. While I was there sketching, I saw another artist doing a plein-air painting and dozens of amateur photographers capturing every vista. I used my usual Lamy Safari/Noodler's Lexington Gray ink to draw, and then experimented with my latest acquisition -- a host of Caran d'Ache Neocolor II water-soluble crayons. I'm still getting the hang of them, but I like the intense color they produce. 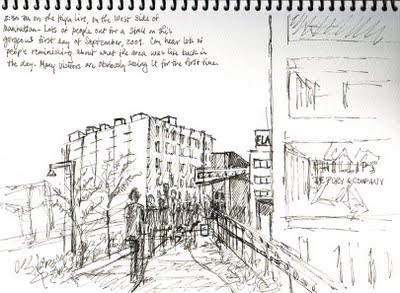 24th Worldwide Sketchcrawl is on Sept. 19!